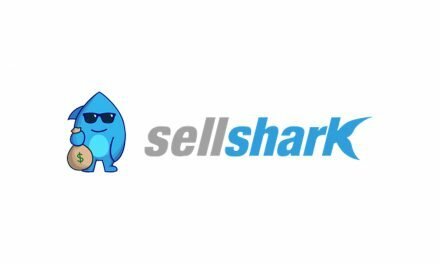 Gizmogul.com Review - What Is This Buyback Site Hiding? 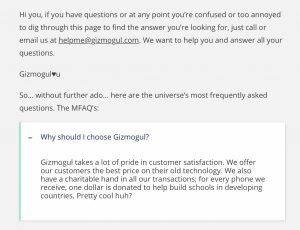 Gizmogul is an interesting and well-branded iPhone buyback site with a charitable bent, but the lack of online reviews makes it a less than solid choice. Their payouts are on the low side but fairly quick and they offer a number of customer service options. They buyback a wide variety of devices, especially in the Apple family. 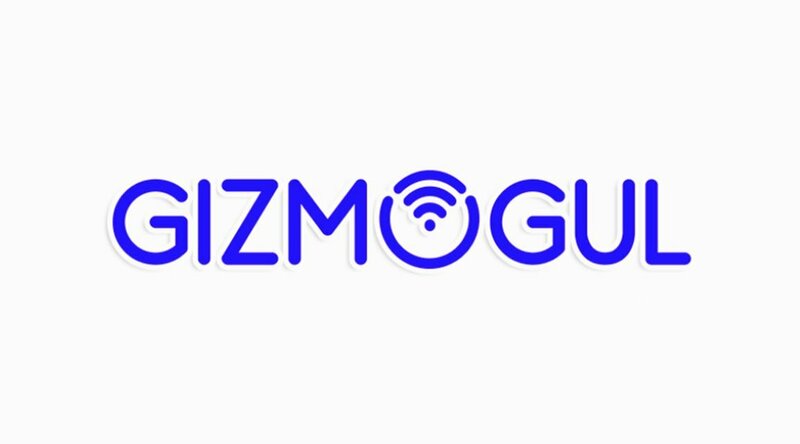 Not to be confused with tech news site Gizmodo (or handheld game Gizmondo), Gizmogul is a mobile buyback business based in Boston that’s been around since 2013. Founded by the brothers Schneider (Cory, Barry, and Stephen), Gizmogul is an interesting site for its purported millennial appeal. They give $1 for every transaction to BuildOn to build schools domestically and abroad, doing real good in the world. This in contrast to the somewhat wishy-washy, broadly sold concept that selling back your iPhone saves it from going to a landfill (which, while true, is also prevented by you leaving it in your kitchen drawer forever for your great grandchildren to someday find and marvel over). Also, Broad City fans will recognize founding brother Stephen Schneider as that neighbor across the hall that Abbi, well… she gets to know him very well. All sounds great, right? Right! But not so fast. 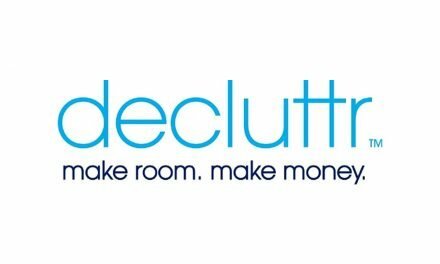 There does seem to be a hiccup with Gizmogul: they don’t really have… any reviews. Sure, they’re doing great on TrustPilot, but so is everyone else – it doesn’t seem to be a particularly reliable source. A Better Business Bureau search for Gizmogul redirects you to this site and their Facebook seems to be closed to reviews and visitor posts. So we’ll look at what their site says and take it with a grain of salt! Lots! Especially in the Apple family. 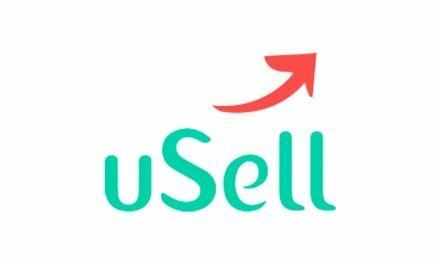 Gizmogul is similar to sites like GadgetGone, Buyback Boss and SellShark, all of which specialize in apple products. They’ll buyback iPhones, other smartphones, iPads, tablets, smart watches, Macbooks, and iPods. Their iPhone bids currently cover iPhone 5 to iPhone 8 Plus, and their list of other smartphones they’ll take is fairly robust. The quoting process is pretty easy! 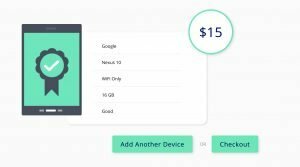 Like with most sites, you click your relevant options on the device and they give you an instant quote. This is true for devices of all sorts, not just iPhones, which is nice, and their graphics are cutesy instead of the standard product photo. That said, they have one weird thing on the site: if you press the back button on your browser during the quoting process, it sends you back to the home page (there’s a back-navigation button built into the site instead). Not huge but a little frustrating! Funnily enough, they’re a little vague about what they provide for shipping, but a little deductive reasoning indicates that they provide a free shipping label and some sort of mailer that may or may not be the right size for your device, and they ship via USPS. You are, as is standard, expected to provide your own bubble wrap or padding. 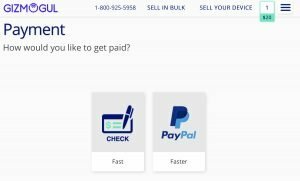 Gizmogul provides two payment options: PayPal and check. Boy, do they ever have options here! 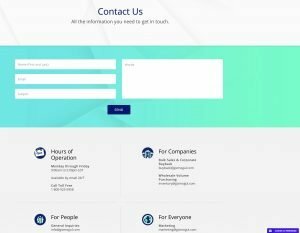 They offer a phone number, online form, multiple email addresses, and a live chat. Email is 24/7 and they rest are 9 am-5 pm EST Monday-Friday. Cool. Hard to gauge their customer service team’s overall success without any customer reviews, but the options for getting in touch are nice! Not much else to write home about in terms of guarantees, promotions and such, but if you’re looking to do a little good in the world, there’s nothing, um, clearly wrong with them. Ahh, sorry, Gizmogul! Payouts are not great. Other devices are about on par for the average, but iPhones are low. Where the average for an iPhone 6s in good condition is $150+, they’re offering $135. That said, their payouts are pretty quick! 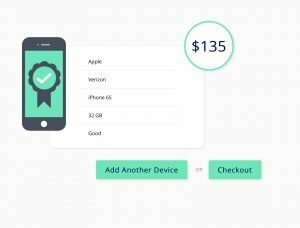 They say they only take 1-2 business days to check your device once received, which is unique – most sites only give turnaround time from once it’s been reviewed, not received. Make sure to check other sites like Buyback Boss, Decluttr, and ItsWorthMore to make sure you get the best offer. Hey, who knows? They could be great. I want to believe in them, but there’s a funk to such a limited online presence for one of these companies, since most are heavily reviewed for the good and the bad. Use at your own risk, but hey, at least you’ll be helping build a school! 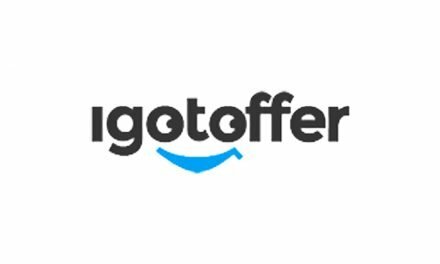 Gizmogul’s a neat little buyback site. Unfortunately, their most unique feature is in their branding and company ethos and the quality of their service is unclear. The payouts are on the low side but the turnaround is fast. This is somewhere you’ll have to just use your judgment. One more thing – you could always take that higher payout from another site and donate a portion of it if you were so into doing good in the world. Just a thought! Reviewer out! 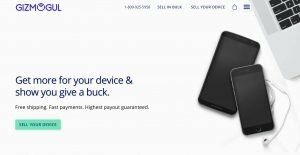 PreviousMaxBack Review – A Buyback Site Shrouded In Mystery?